Is Yum Cha Food Healthy? Yum cha food is more commonly known in the United States as dim sum. Traditionally, these small plates of food are served with tea. Yum cha can be nutritious or unhealthy, depending on the type of dish you choose and how much of it you eat. Understand the calories, fat and sodium content of yum cha dishes before you partake. Chinese dumplings come in a variety of choices, usually gyoza skins -- egg roll wrappers -- stuffed with pork, beef, shrimp or vegetables. 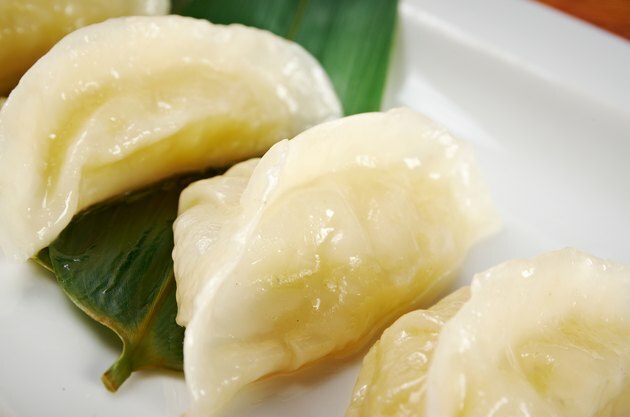 A one-dumpling serving of steamed shrimp dumplings, for instance, is relatively healthy, containing 44 calories, 1 gram of fat and 3 grams of protein. It does, however, contain 120 milligrams of sodium, and this can be higher if you dip the dumpling in soy sauce. A steamed pork dumpling is slightly more caloric, with 67 calories per dumpling; it is also higher in sodium: 183 milligrams. The American Heart Association suggests keeping your daily intake of sodium to 1,500 milligrams per day. Opt for steamed dumplings -- fried dumplings have more fat and calories. Chinese steamed buns pair savory and sometimes sweet fillings with a fluffy, breadlike shell. A pork barbecue bun is less healthy than a bun filled with chicken and vegetables. The pork bun contains 185 calories and 6 grams of fat, while a chicken- and vegetable-filled bun introduces 90 calories and 1 gram of fat. The sodium content may vary based on ingredients. Watch your fat intake if you opt for the pork barbecue Chinese buns -- the daily recommended limit ranges from 44 grams to 78 grams. You may find rice noodle rolls, or cheong fan, on a yum cha cart. This type of dim sum wraps barbecued pork, beef and shrimp inside wide rice noodles or rice paper; they are they fried and steamed and often served with soy sauce. Because they are fried, they are quite caloric -- one roll may contain 265 calories and 7.7 grams of fat. Over 3 grams of this is saturated fat, the type that may raise your chances of developing some forms of diabetes and heart disease. Avoid consuming more than 16 to 22 grams of saturated fat each day. Barbecued spare ribs are a popular option for kum cha. While this option is full of quality protein, it is not the healthiest dim sum you may choose. An order of four Chinese spare ribs contains 600 calories and 14 grams of fat. This may be too much for a single meal -- the Diet Channel notes that women generally require 300 to 500 calories per meal, and men should contain their meals to 400 to 600 calories. In addition, a serving of these ribs introduces 900 milligrams of sodium into your diet, a significant portion of the daily suggested limit. Is Chinese Food Healthy to Eat?